Soulja Boy was a big fan of Gucci until the wool balaclava jumper received backlash for resembling Blackface. Before the 2019 Grammy Awards on Sunday night walking the streets of L.A. with Ray J. During their impromptu conversation, the rapper reveals that he wants to remove the brand from his life entirely including his tattoo that was inspired by the brand. "I Love Gucci, man. I got a Gucci tattoo in the middle of my forehead," Soulja Boy recently said. 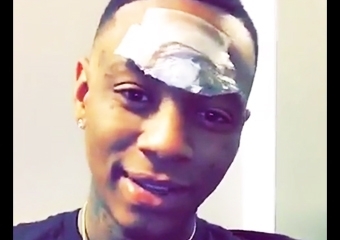 When asked if he was going to get it removed, Soulja responded, "I've already started the process. I've got to go back two more times. I've already been three times." After boycotting Gucci on Instagram, Soulja also revealed that he plans to give away the current Gucci merchandise in his possession to charity. Although he knows a lot of people won't want to wear Gucci anymore, he understands that those who are less fortunate will gladly accept his donation. Elsewhere during his brief convo, Soulja says he feels like he's been slighted by the fashion giant. "I spent hundreds of thousands of dollars, if not millions, over the last two years on the brand so it's like I feel so disrespected by them," Soulja Boy said about Gucci. After Soulja Boy shared his thoughts on the situation, Gucci's own Dapper Dan released a statement about Gucci's racist clothing. The Harlem native went on Instagram to say that "no excuse nor apology can erase this insult" from Gucci. He also plans to meet with the CEO of the brand to work things out. Lets see what happens.